The Truth According to Wikipedia, also referred to as Wiki's Truth (Dutch: Wiki's Waarheid), is a Dutch documentary about Wikipedia directed by IJsbrand van Veelen. It was screened at The Next Web conference in Amsterdam on 4 April 2008 and broadcast by the Dutch documentary series Backlight (Dutch: Tegenlicht) on Nederland 2 on 7 April 2008. It was subsequently made available through American Public Television. The documentary examines the reliability of Wikipedia, and the dichotomy between usage of experts versus amateur editors. The documentary includes commentary from Wikipedia co-founders Jimmy Wales and Larry Sanger, The Cult of the Amateur author Andrew Keen, O'Reilly Media chief executive officer Tim O'Reilly, and former editor-in-chief of Encyclopaedia Britannica Robert McHenry. Keen argues that experts should serve as guardians of information during the Web 2.0 phenomenon; this point of view is supported by analysis from Sanger. 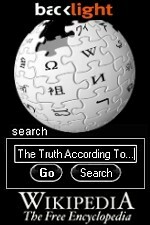 The Truth According to Wikipedia received a generally positive reception, with Film Quarterly calling the documentary: "a sharp and wide-ranging overview of wikipistemology". The Center for Strategic and International Studies gave the documentary a rating of "Good", and called it a useful resource to teach students about appropriate sourcing. Author Mirko Tobias Schafer described it as an apt debate over truth as represented on the website. New media writer Stephen Downes said the documentary was captivating for its ability to place Wikipedia within the wider context of the Web 2.0 social phenomenon.